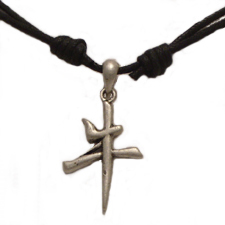 Below are 12 different Chinese pendant chokers representing the lunar cycle. For example, the birth year 2004 is the year of the monkey. Listed below are the birth years, horoscope descriptions and pendant ordering item number. The approximate pendant size is 3/4" tall and 3/4" wide. The black lace choker is size adjustable, can be worn as a choker or up to a 22” necklace. The order item button is at the very bottom of the page. People born in the year of the rabbit are usually kind and popular. They make excellent company, have beautiful homes and are well dressed. They succeed as artists and are careful in making decisions, compatible with those born in the year of the pig, goat, dragon and dog. People born in the year of the dragon are gifted with power and good luck. They are born leaders and perfectionists, excellent in position of authority or doing anything they wish whether it is artistic, medical or political. The dragon wins in love. They are compatible with people born in the year of the rat, boar, tiger and rabbit. People born in the year of the snake are very seductive, charming and popular. They have excellent manners and are usually highly intelligent, making brilliant teachers, thinkers and innovators. They are compatible with people born in the year of the ox, rooster, dragon and horse. People born in the year of the ox are hard working and persistent. They have a lot of perseverance. They are self confident and see things their own way and also succeed well in business, medicine, the arts, construction or real estate. They are compatible with those born in the year of the rat, rooster, monkey and snake. People born in the year of the rat have lots of charm, savvy, and determination. They are good communicators and once you earn their trust you’re treated like family. They make good business people or politicians. They are sensual and loving compatible with people born in the year of the dragon, ox, tiger, and boar. People born in the year of the rooster are very observant and precise with a keen sense of what is going on around them. They are naturally social and also dreamers, steadfast in love. They are compatible with people born in the year of the snake, ox, boar and monkey. People born in the year of the ram are very elegant and charming. They have a love of nature and are very creative, making them greatly admired and good at being artists and writers. They are very romantic in love and caring, compatible with people born in the year of the boar, horse, dragon and rabbit. People born in the year of the boar are very sincere, tolerant and honorable. They are caring and trustworthy. They want to do things right. They are greatly admired in love and are compatible with people born in the year of the goat, dragon, boar and rat. People born in the year of the tiger are born leaders. They are noble, fearless and attractive personalities, good at making money, passionate and romantic, compatible with those born in the year of the horse, dog, monkey and boar.